It’s an extremely difficult task to nitpick an Arizona Cardinals’ team that finished with the second-best record in the league at 13-3. There are not many areas that need improvement due to their balanced roster on both sides of the ball, which put them near the top of the league in both aspects. However, there were a couple noticeable areas that the team needs to upgrade in order to improve their chances of reaching the Super Bowl next season. Here were the three worst mistakes the Cardinals made in 2015. There’s no question that the Cardinals possess one of the league’s best defenses led by their secondary, but one obvious weakness is the team’s lack of pass rush, ranking 20th in the NFL with 36.0 sacks in the 2015 season. Although they made an excellent early-season addition by signing Dwight Freeney — who led the team with 8.0 sacks despite playing in just 11 games — there wasn’t a single player that notched a double-digit sack total. 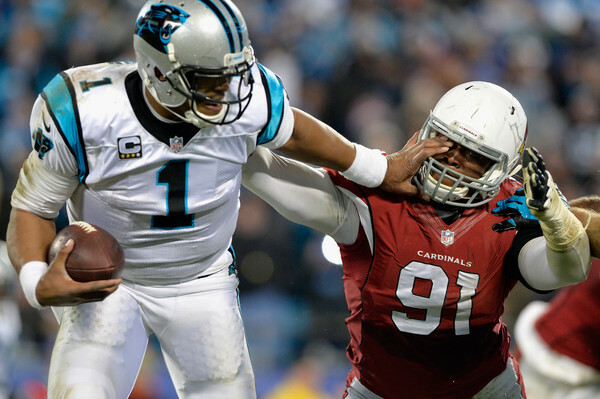 The next highest amount after Freeney was 5.0 sacks from star defensive tackle Calais Campbell. There’s a pressing need to add a couple pass rushers in the offseason, which could have turned the tide in their favor against the Carolina Panthers in the NFC Championship game. In Super Bowl 50, it was quite clear how an effective pass rush can affect the game, as the Broncos’ dynamic duo of DeMarcus Ware and Von Miller made it extremely difficult for Cam Newton to establish any level of comfort due to the consistent pressure he faced. Ware and Miller are both premier talents at their position, but their performances in Super Bowl 50 proved to be the difference-maker against a seemingly unbeatable Panthers’ squad. Heading into the offseason, the top priority will be to address their lack of a pass rush, which could potentially be the missing piece to the puzzle for them to finally get over the hump in the playoffs. It’s been quite some time since the Cardinals fielded a top-tier tight end who can be a game-changer in the passing game. Offseason addition Jermaine Gresham didn’t exactly make a significant impact in his first season with the team, posting career lows in receptions (18), receiving yards (223) and touchdowns (one) while starting 12 of the 15 games he played. Darren Fells didn’t do much either in his third season in the league despite posting career highs in catches (21), receiving yards (311), and touchdowns (three). This limits the Cardinals to rely on their wide receiver group — led by a resurgent Larry Fitzgerald — in critical points in the game and in the red zone. This mistake stems from the offseason, when the team elected to sign Gresham to a one-year, $3.1 million contract instead of pursuing a better option in free agency, such as Jordan Cameron, Charles Clay, or even Julius Thomas. Cameron and Clay both signed affordable multi-year deals with a base salary of $7.5 million and $7.6 million respectably. Thomas’s deal wasn’t entirely out of their budget as he signed a five-year, $46 million contract with the Jacksonville Jaguars. In truth, the Cardinals could have gained each of these players if the team had showed significant interest in any of them. The Cardinals are an appealing team that has established themselves as a powerhouse in the NFC in a pass-happy offense. The decision to go the inexpensive route to add a tight end who hasn’t put together a season that could rival those of Thomas, Clay, or Cameron may have affected the flow of their offense at times. This isn’t suggesting that getting Gresham was the be-all and end-all for the Cardinals, but adding a top-tier tight end would have been a huge benefit to their explosive offense. The Cardinals began the season with 0ft-injured running back Andre Ellington as the starter, but as expected, he was limited by injuries throughout the year, dealing with a nagging turf toe issue. In the short term, it was a blessing in disguise for Chris Johnson, who took advantage of the prime opportunity to be the lead back rushing, putting together four 100-yard rushing performances prior to suffering a broken leg late in the season. Johnson once again looked like an explosive runner and could continue to be productive in the latter portion of his career. However, his injury opened up the way for talented rookie David Johnson to showcase his unique talent of being a huge factor in both the passing and running game. He posted three consecutive 90-plus rushing yards in his first three starts, including his career-100 rushing yard performance when he recorded 187 rushing yards and three touchdowns against the Philadelphia Eagles. Although David struggled in the last two regular-season games, he made an excellent case for being the Cardinals’ starting running back next season. He was quite productive in the last five games of the season, finishing eighth in rushing yards (581) and receptions (36) among all rookies. This leads one to wonder what kind of season David could have put together if he’d earned the starting gig to begin the year. He’s the most talented running back for the Cardinals. Yes, Chris Johnson put together an encouraging campaign, but it was quite evident that the rookie Johnson should have been the choice from the start of the season. NFL: What Should the Cardinals Do With Carson Palmer?